U.S. 13 represents the longest signed route within the First State. The route alternates between sections of rural highway and urban arterial throughout its course north through cities and towns such as Laurel, Seaford, Bridgeville, Camden, Dover, Smyrna, Odessa and Wilmington. Through Wilmington, the route varies as an urban boulevard and along one-way streets as it bypasses the city center to the east. The remainder to Claymont and Pennsylvania runs along Governor Printz Boulevard, a four-lane divided highway, and Philadelphia Pike, a four-lane boulevard. U.S. 13 enters Delaware from the industrial borough of Marcus Hook, Pennsylvania along Philadelphia Pike. The four lane boulevard intersects the east end of Delaware 92 (Naamans Road) by the site of the former Evraz Claymont Steel plant in Claymont (the plant was demolished in 2016-17). South of there a parclo interchange joins the US route with Interstate 495. Claymont, a census-designated place, varies with post World War II subdivisions and older retail plazas through the northeastern corner of the state. Philadelphia Pike represents the main north-south route through the community. U.S. 13 (Philadelphia Pike) lowers from I-495 to intersect Alcott Avenue in Claymont. Beyond the reassurance marker was the Evraz Claymont Steel (formerly CitiSteel) industrial plant and intersection with Naamans Road (Delaware 92). Photo taken 12/21/16. One half mile south of I-495 in Claymont, U.S. 13 branches east from Philadelphia Pike along Governor Printz Boulevard. Governor Printz Boulevard veers southwest to run along the west side of Interstate 495 between Claymont and an area near the town of Bellefonte. A grassy median or narrow concrete barrier separates the four lane highway. Philadelphia Pike, originally named Wilmington Post Road, continues southward into the city of Wilmington as U.S. 13 Business. Until 1970, Governor Printz Boulevard was posted as U.S. 13 Alternate while U.S. 13 remained along Philadelphia Pike to Market Street in Wilmington. Once at Edgemoor, U.S. 13 (Governor Printz Boulevard) intersects Delaware 3 adjacent to the Edgemoor Road interchange with Interstate 495. SR 3 ends just to the south at I-495 and Hay Road by Edgemoor Industrial Park. U.S. 13 meanwhile turns more west beyond SR 3 by Merchants Square Shopping Center to enter Wilmington along Northeast Boulevard. Northeast Boulevard comprises a four to five-lane arterial between the city line and the bridge over Brandywine Creek at Twelfth Street. U.S. 13 travels between the Eastlake and Riverside neighborhoods along this stretch. The boulevard and Governor Printz Boulevard were originally built to bypass the steep grades along Philadelphia Pike. Just across Brandywine Creek, U.S. 13 (Northeast Boulevard) separates into a couplet at Kirkwood Park. U.S. 13 southbound follows East 11th Street west and Spruce Street south while northbound lines Church Street for ten blocks from Delaware 9 (East 4th Street) to East 11th Street. The U.S. 13 couplet concludes at East Fourth Street, as the US route combines with Delaware 9 eastward across the Christina River on a double leaf bascule bridge. Beyond there, the tandem enter the Southbridge community while intersecting Delaware 9A (Christina Avenue). Three blocks further south, U.S. 13 & Delaware 9 partition along a couplet using Heald Street southbound and New Castle Avenue northbound. A loop ramp takes SR 9 southbound underneath the Heald Street bridge over a Norfolk Southern Railroad line to connect with New Castle Avenue. U.S. 13 northbound utilizes D Street for one block between the same bridge and New Castle Avenue (Delaware 9). U.S. 13 & Delaware 9 south separate into a pair of one-way streets through Southbridge in Wilmington. Heald Street carries the tandem south six blocks to D Street, while northbound runs along New Castle Avenue for five blocks between D and Lobdell Streets here. Photo taken April 10, 2004. U.S. 13 exits the city of Wilmington just south of the connector ramp to SR 9. Heald Street curves southwest through industrial areas another half mile to the merge with U.S. 13 Business (Market Street) at Rogers Corner. There Dupont Highway begins as U.S. 13 meets Interstate 495 at a directional cloverleaf interchange. This exchange was expanded in 2000 to provide access between I-495 south to U.S. 13 north and from U.S. 13 south to I-495 north. U.S. 13 widens to six lanes through the Minquadale community as it leads away from Interstate 495 toward the Farnhurst Interchange with Interstate 295 and U.S. 40. The directional interchange with I-295 was initially reconstructed between 2001 and 2003. Previous work eliminated the left-hand ramp from U.S. 13 south to I-295 north and replaced it with a left-hand turn onto the U.S. 13 northbound on-ramp to the freeway. Ramps from Interstate 295 south & U.S. 40 west to U.S. 13 were also redesigned in the process. Work between February 2015 and December 2018 further redesigns the Farnhurst Interchange to add a new loop ramp from U.S. 13 north to I-295 south in place of the current horseshoe ramp tieing into the left-hand side of the freeway. U.S. 40 combines with U.S. 13 (Dupont Highway) between I-295 and Pulaski Highway at State Road for a four-mile overlap. The Farnhurst Interchange also represented the south end of U.S. 202 until 1970 and the north end of U.S. 301 until 1993. U.S. 202 previously overlapped with U.S. 13 north through Downtown Wilmington. Dupont Highway expands to eight lanes along the cosigned stretch of U.S. 13 & 40 by Wilmington Manor, Penn Acres, New Castle County Airport (ILG) and Hares Corner. Meeting the arterial along this busy stretch is U.S. 202 and SR 141 at Basin Road and SR 273 at Frenchtown Road. The compact three-quarter cloverleaf interchange at Basin Road doubles as the southern terminus of U.S. 202. SR 141 otherwise leads south to New Castle and north to Newport. Southbound U.S. 13 (Dupont Highway) ahead of the split with U.S. 40 (Pulaski Highway) at State Road. Photo taken 12/20/16. U.S. 13 south and U.S. 40 west part ways at State Road. U.S. 13 continues with four overall lanes by Llangollen Estates while U.S. 40 shifts westward along the four-lane Pulaski Highway to suburban Bear and Glasgow. Pulaski Highway extends west as the route of U.S. 40 to Baltimore, Maryland. U.S. 13 runs southeast of Bear to merge with SR 1 at Tybouts Corner. Initially opened in 1991, SR 1 travels north to Interstate 95 and SR 58 at Churchmans Crossing. A wide trumpet interchange joins the four-lane commuter freeway with U.S. 13 (Dupont Highway) amid intersections with both SR 71 (Red Lion Road) and Bear Road. SR 71 branches southwest to Red Lion and Kirkwood as the historical route of U.S. 301 South. Bear Road provides northbound access to SR 1 toward Christiana. Construction of the SR 1 Turnpike between 1992 and 1995 directly overlayed Dupont Highway southwest from Tybouts Corner across Red Lion Creek. South of Red Lion Cree, two segments of the original Dupont Highway remain in place along the west side of U.S. 13 & SR 1. The northbound roadway of the former route was abandoned while the southbound roadway was repurposed as a two-lane frontage road for adjacent homes and businesses. Once over SR 7, U.S. 13 & SR 1 shift west of Dupont Highway. SR 7 saw extension southward from its previous terminus at U.S. 13 to run along Dupont Highway to SR 72 at Wrangle Hill. U.S. 13 rejoins Dupont Highway by doglegging east from SR 1 along SR 72 (Wrangle Hill Road). The U.S. 13 overlap with SR 1 between Wrangle Hill and Tybouts Corner was formally approved by AASHTO on April 19, 1996. Continuing south from Wrangle Hill, U.S. 13 (Dupont Parkway) approaches the community of North St. Georges. Suburban development lines both sides of the four-lane highway by Dragon Creek. Once at the approach to the St. Georges Bridge, U.S. 13 reduces to one lane per direction. 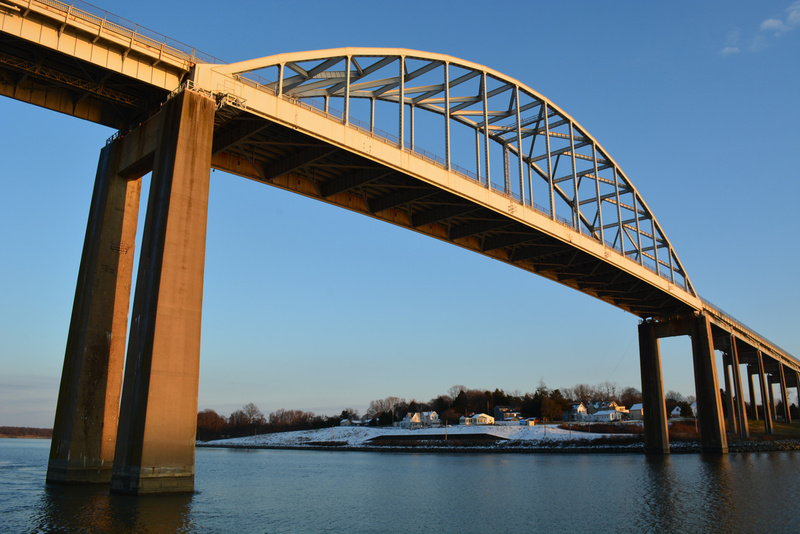 Opened to traffic in 1942, the tied arch bridge across the Chesapeake and Delaware Canal links U.S. 13 with South St. Georges. Structural deterioration of the concrete deck and steel support beams in the 1980s and early 1990s resulted in a weight restriction for trucks across the span. A new Truck route for U.S. 301 was posted to redirect semis to use Summit Bridge to the west. When the SR 1 C & D Canal Bridge opened just west of St. Georges on December 23, 1995, DelDOT intended on permanently closing the St. Georges Bridge and eventually dismantling it. A heated battle quickly ensued between the state, the Army Corps of Engineers, and St. Georges area residents concerning the future of the steel arch bridge. A temporary closure of the bridge followed in 1997, but the bridge was ultimately retained with reconstruction of the bridge deck and painting of the superstructure completed in 2001. St. Georges Bridge from Mike Castle Trail along the north banks of the Chesapeake & Delaware Canal. The four-lane span was restriped to two lanes after 2008, with the outside lanes repurposed for bicyclists. Photo taken 12/16/17. Advancing from South St. Georges, U.S. 13 sees a northbound ramp to SR 1 ahead of Biddles Corner through an increasingly suburban area. Construction underway through 2018 ties in the new U.S. 301 toll road from Middletown with SR 1 on this stretch. The SR 1 Turnpike and Dupont Parkway otherwise switch sides just north of Boyds Corner, where U.S. 13 intersects the south end of SR 896 (Boyds Corner Road). Prior to 1993, SR 896 west from Boyds Corner to Mount Pleasant was a part of the U.S. 301 mainline as it separated from U.S. 13. The formerly rural route now bisects suburban areas anchored by the Bayberry community. Pole Bridge Road also ties into the SR 896 end from an adjacent diamond interchange with SR 1 and SR 9 at Port Penn. U.S. 13 (Dupont Parkway) parallels the SR 1 Turnpike south from Boyds Corner to Drawyer Creek and the town of Odessa. Until November 1999, U.S. 13 through Odessa was often the site of heavy traffic congestion on weekends due to beach traffic, long signal cycles at the SR 299 (Main Street) intersection and slower speed limits. The Odessa bypass takes SR 1 west across U.S. 13 to the Appoquinimink River, where the routes parallel one another directly to Pine Tree Corners. For a brief period of time, U.S. 13 utilized SR 1 as portions of Dupont Parkway were reconstructed to accommodate the new tollway. Dupont Parkway south from Pine Tree Corners to the Kent County line remains rural. Delaware 71 (Summit Bridge Road) ends at U.S. 13 near the town of Townsend. The north-south route links U.S. 13 with the growing city of Middletown to the northwest. Otherwise the bulk of through traffic takes the adjacent SR 1 Turnpike as it switches sides with U.S. 13 twice between H & H Corner and Blackbird. Nearing the town of Smyrna, U.S. 13 and Delaware 1 cross paths once more at a parclo interchange. Opened on December 18, 1993, the Smyrna bypass of SR 1 takes the toll road east from U.S. 13 to the south Smyrna by Big Oak County Park. Between 1993 and 2003, U.S. 13 temporarily looped around the north end of the Dover-Smyrna bypass segment of SR 1. The interchange ties into a tourist information center and rest area along the east side of Dupont Parkway. South across Duck Creek, U.S. 13 enters Kent County and transitions into a commercial arterial through the heart of Smyrna. Named Dupont Boulevard, U.S. 13 intersects the north end of SR 300 at Glenwood Avenue while overlapping with SR 6 from there to Commerce Street. SR 6 connects Smyrna with Woodland Beach to the east and adjoining Clayton to the west. SR 300 forms a multi-state route with MD 300 leading southwest to Kenton, Sudlersville and U.S. 301 in Maryland. The SR 1 Turnpike remains east of the U.S. 13 corridor from Smyrna southward to the capital city of Dover. Dupont Boulevard becomes Dupont Highway south of the Leipsic River as U.S. 13 continues as a commercial arterial by the town and into north Dover. Scarborough Road links the US highway with SR 1 to the east and SR 15 to the southwest. U.S. 13 stays east of Silver Lake and the State Capitol through Dover along commercialized Dupont Highway while U.S. 13 Alternate acts as a business route along Governors Avenue and State Street through Downtown. U.S. 13 expands into six-lanes south from Scarborough Road by Dover Mall, Dover International Speedway and Delaware State University. The busy route separates with U.S. 13 Alternate (State Street) at Leipsic Road on this stretch. U.S. 13 Alternate crosses Silver Lake to enter the Dover street grid ahead of Downtown. It returns to U.S. 13 by way of Governors Avenue near Moores Lake. Delaware 8 (Division Street) bisects Dover between Pearsons Corner and Little Creek. The state route intersects U.S. 13 just north of the historic split with U.S. 113 (Bay Road). Photo taken April 13, 2004. U.S. 113 was truncated from Dover south to Milford while U.S. 113 Alternate between Dover and Little Heaven was eliminated in February 2004. The split of Dupont Highway and Bay Road was a source of traffic congestion until the 1993 opening of the SR 1 toll road to the east. Bay Road otherwise joins Dover with Dover Air Force Base as an unnumbered arterial southeast to SR 1 at SR 10. U.S. 13 turns westward from Bay Road as a four-lane commercial arterial through south Dover. Converging with Dupont Highway at Puncheon Run is a freeway spur from the SR 1 toll road. Opened to traffic by January 2001, the Puncheon Run Connector provides uninterrupted access between U.S. 13 and the SR 1 toll road mainline. The connection allows through long distance travelers bound for Salisbury, Maryland, Norfolk, Virginia, and other points downstate access to the turnpike to bypass the city. Crossing Isaac Branch south from Moores Lake, U.S. 13 enters the town of Camden. There a second U.S. 13 Alternate loops west along Old Camden Road and Main Street while U.S. 13 (Dupont Highway) runs along the east side of town. The auxiliary route continues southward from Camden along Upper King Road to Woodside before returning to U.S. 13 at Canterbury. Intersecting U.S. 13 along this stretch also is Delaware 10, an east-west route between Wyoming and Dover Air Force Base. Leaving the Dover area, a number of subdivisions built over former farm land appear to the east of U.S. 13 as Dupont Highway nears the town of Felton. There Delaware 12 crosses paths with the US highway from Main Street through Felton to Midstate Road east to Frederica. Next along U.S. 13 is the city of Harrington, where Dupont Highway separates into a one-way couplet with businesses occupying space the north and southbound lanes. Delaware 14 connects the city with Milford to the east and Burrsville, Maryland to the west. An advance sign for SR 1, replaced by 2008, posted 2.5 miles ahead of the Puncheon Run Connector on U.S. 13 north. The limited access highway also connects U.S. 13 with Bay Road (former U.S. 113) near Dover A.F.B. Photo taken by JP Nasiatka (09/01). U.S. 13 (Dupont Highway) crosses the Sussex County line along a rural stretch south of Farmington. Within Sussex County, U.S. 13 is named Sussex Highway. 1.6 miles beyond the county border, the US route enters the town of Greenwood. 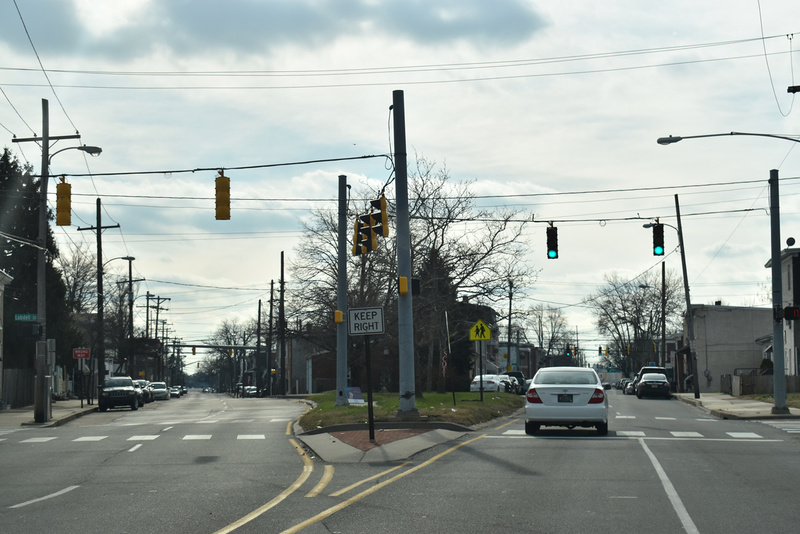 Staying east of the town center, U.S. 13 separates into a one-way couplet along a commercial strip while intersecting Delaware 16 & 36 (Market Street / Beach Highway). South from Greenwood, U.S. 13 parallels the Nanticoke River to SR 404 (Newton Road) north of Bridgeville. SR 404 combines with U.S. 13 south for 2.5 miles along the east side of Bridgeville as part of its multi state route east to Georgetown and Five Points and west to Denton and Wye Mills, Maryland. U.S. 13 Alternate provides a business loop from Sussex Highway west to the Bridgeville historic district as well. The Bridgeville town limits extend south along U.S. 13 to SR 18 (Cannon Road). SR 18 west links U.S. 13 with Federalsburg, Maryland by way of MD 318. A short distance beyond there, U.S. 13 (Sussex Highway) reaches the city limits of Seaford. The bulk of Seaford lies west of U.S. 13 (Sussex Highway), while the US highway overlaps with SR 20 for 0.84 miles south from a heavily developed retail corridor to cross the Nanticoke River to the town of Blades. SR 20 constitutes a cross county route west to Reliance and east to Millsboro and Fenwick Island. Five miles south of Blades, U.S. 13 passes through eastern reaches of the Laurel town limits to intersect U.S. 9 (County Seat Highway). Extended into Delaware by way of the Cape May-Lewes Ferry in 1974, U.S. 9 runs east-west across Sussex County to Georgetown, Five Points and Lewes. Crossing Records Pond, U.S. 13 (Sussex Highway) meets SR 24 (Laurel Road / 4th Street). The state route arcs northeast from near Sharptown, Maryland to Laurel, Millsboro and Midway. U.S. 13 bee lines south from SR 24 to intersect SR 30 east of Bacons to the town of Delmar. The US highway intersects Delaware 54 / Maryland 54 at the state line. The multi state route begins at Mardela Springs, Maryland to the west and ends at Fenwick Island to the east. U.S. 13 exits the state as a congested arterial route to Salisbury. There are four bannered routes for U.S. 13 in Delaware. Within Sussex County a Business Route loops 2.6 miles west from U.S. 13 (Sussex Highway) through the town of Bridgeville. Two Alternate routes are posted within Kent County. The southern route serves Woodside and Camden along a 5.69 mile course. The northern route provides a 3.86 mile long business loop through Downtown Dover along Governors Avenue and State Street. The final bannered route is located in Northern New Castle County. U.S. 13 Business there runs through Downtown Wilmington and along Philadelphia Pike through Claymont. This route was formerly the U.S. 13 mainline, while U.S. 13 along Governor Printz and Northeast Boulevards through east Wilmington was designated U.S. 13 Alternate. A short lived auxiliary route, U.S. 13 Alternate took the former alignment of U.S. 13 for 16.5 miles between the Maryland state line and Hearns Mill in southwestern Sussex County. U.S. 13 Alternate was established after U.S. 13 opened along Sussex Highway to the east after 1953. The route was dropped on the 1957-58 Official Delaware Highway Map. The route followed Bi-State Boulevard north from Delmar to Central Avenue through Laurel. Laurel Road extended the bannered highway northward to Market Street at Blades and Front Street through Seaford. This section also doubled as SR 20 between High Street and Stein Highway. Bridgeville Highway returned the route to U.S. 13 by way of Hearns Mill. U.S. 13 Alternate followed the current U.S. 13 mainline between south Wilmington and Claymont via Heald Street, New Castle Avenue, 4th Street, Church & Spruce Streets, Northeast Boulevard and Governor Printz Boulevard. 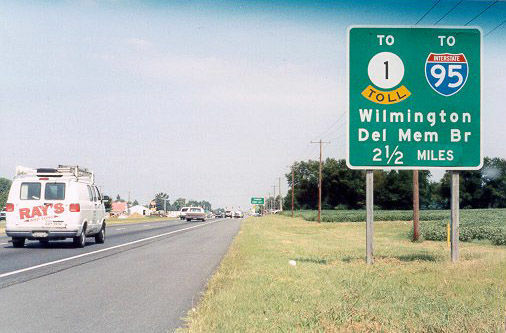 Prior to 1970, U.S. 13 traveled through Downtown Wilmington on what is now U.S. 13 Business. 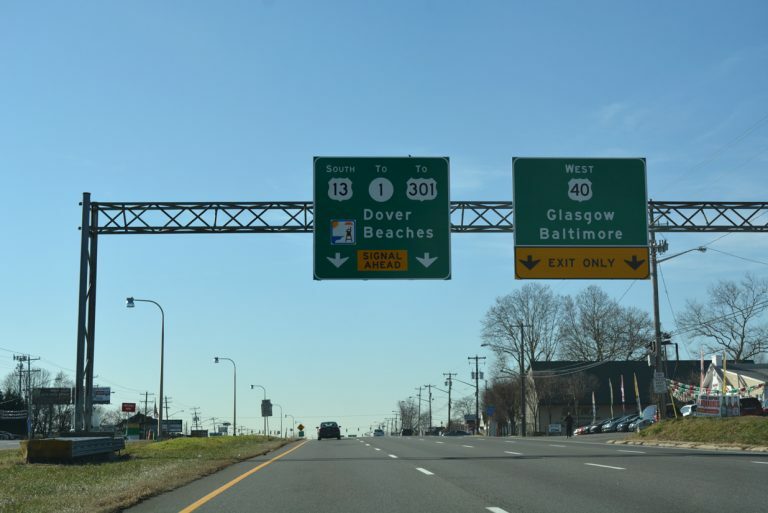 U.S. 13 Bypass was a temporary designation applied to Delaware 1 over the Chesapeake and Canal Bridge between Exit 152 by North St. Georges and U.S. 13 at South St. Georges. The route remained in place from 1995 to 1998 in an effort to shift traffic from U.S. 13 onto the then new bridge west of St. Georges. During that time plans called for the permanent closure of the 1942-built St. Georges Bridge and the span did close for a period in 1997. Ultimately the old bridge was rehabilitated and U.S. 13 Bypass was eventually decommissioned. Delaware Avenue acts as a business loop northeast from Downtown Harrington to U.S. 13 (Dupont Highway) at Jackson Ditch Road. U.S. 13 bypasses the town center to the east between Felton and Greenwood. Photo taken 01/15/17. Joe Goldsborough Road connects Duck Creek Road and North Main Street from Smyrna with U.S. 13 (Dupont Parkway) across from Paddock Road. Photo taken 12/31/16. Main Street leads north from Smyrna and SR 6 & 300 (Glenwood Avenue) to become Duck Creek Road leading into New Castle County. The rural road ties into U.S. 13 (Dupont Parkway) at the ramps with SR 1 south. Photo taken 06/17/12. All signs posted along Duck Creek Road at U.S. 13 (Dupont Parkway) were replaced by 2014. 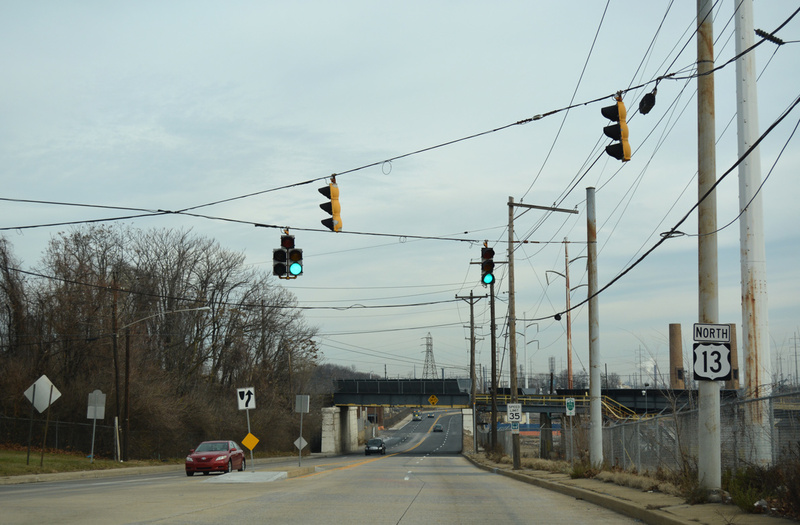 The forthcoming signal ties in directly with the southbound on-ramp for Delaware 1 to Dover. Photo taken 06/17/12. U.S. 13 travels north below Delaware 1 to the northbound on-ramp for Wilmington. U.S. 13 south enters Smyrna a short distance to the south. Photo taken 06/17/12. Bear Road provides the connection from U.S. 13 (Dupont Parkway) south to Delaware 1 north at Tybouts Corner. Photo taken 09/27/14. Delaware 1 opened between U.S. 13 at Tybouts Corner and Delaware 273 near Christiana in 1991. The route constitutes a busy commuter route from Bear to I-95 at Churchmans Crossing. Photo taken 09/27/14. Boulden Boulevard comprises a four-lane arterial leading west from Moores Lane and Southgate Industrial Park to U.S. 13 & 40 (Dupont Parkway) just south of the Farnhurst Interchange. Photo taken 06/02/12. Boulden Boulevard ties into U.S. 13 & 40 (Dupont Parkway) across from Bacon Avenue at the Wilmington Manor community. This intersection is often congested due to the proxmity of Interstate 295. Photo taken 06/02/12. Rogers Road branches southeast from U.S. 13 Business (Market Street) to quickly cross U.S. 13 (Heald Street) at Rogers Corner. U.S. 13 is well signed from both directions of the arterial. Photo taken 07/31/13. U.S. 13 north leads back into the Southbridge section of Wilmington while southbound overtakes U.S. 13 Business (Market Street) to form the beginning of Dupont Highway leading south toward Farnhurst. Rogers Road otherwise connects U.S. 13 Business with Delaware 9 beyond I-495. Photo taken 07/31/13. 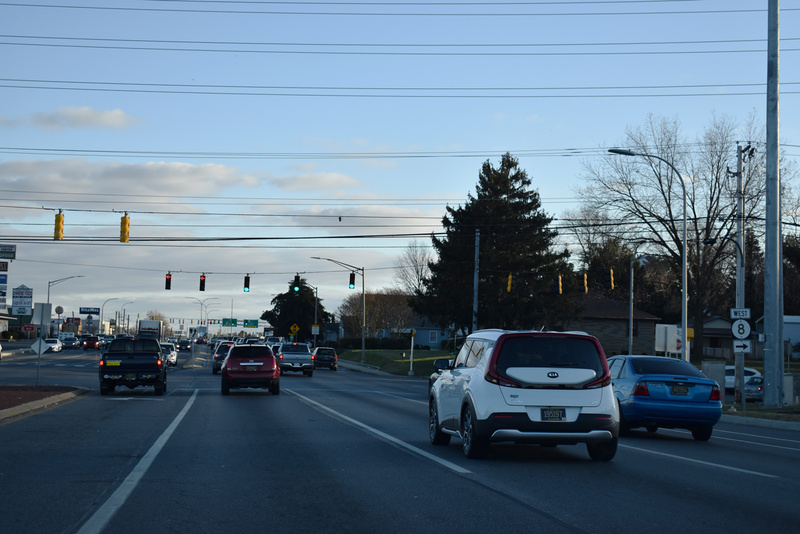 Cauffiel Parkway provides a direct connection from U.S. 13 Business (Philadelphia Pike) at Bellevue Parkway to U.S. 13 (Governor Printz Boulevard), south of Sunset Drive and north of Bellevue Road. The two-lane road opened in 2000 through an addition of Bellevue State Park. Photo taken 08/18/05. The DuPont Highway http://www.hsd.org/DHE/ DHE_where_tranport_Rt13.htm, Historical Society of Delaware web site. "LOCAL NEWS: Work begins on West Dover Connector." Dover Post, February 15, 2015. 07/31/13 by AARoads and I.C. Ligget.